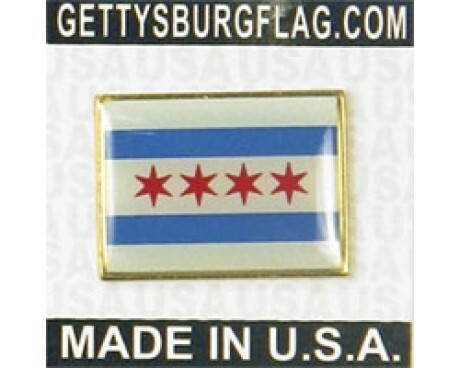 It is common for cities in the United States to have flags of their own, and the city of Chicago is no exception. The Chicago flag has changed more often than many other municipal flags, but those changes have created one of the most distinctive and popular designs in the United States. A study by the North American Vexillological Association found that the Chicago flag has the second best design out of 150 municipal flags in North America. The popularity of the design has made it very easy to find a Chicago flag for sale in most parts of the city, and they remain a common sight at sporting events and other major occasions. A Chicago flag consists of five horizontal stripes that alternate between white and light blue. The lower stripe of white is thicker than the other stripes and contains four six-pointed, red stars. The stripes represent the most distinctive features of the city's geography, while the stars represent the city's history and values. The blue stripes represent the waterways that have had a large impact on the city's history. The upper stripe represents Lake Michigan and the Chicago River, while the lower stripe represents the Great Canal. The white stripes represent North, West, and South sides of the city itself. The first star represents Fort Dearborn, which became an early landmark in the Chicago area. The first star's points represent practical virtues and features of the city, such as commerce and transportation. The second star stands for the Great Chicago Fire, and its points represent abstract virtues such as justice and education. The third star represents the World's Colombian Exposition that the city hosted in 1893, and its points represent the different governments that have had jurisdiction over the city in the past. The fourth and final star stands for the Century of Progress Exposition that the city hosted in 1933, and its points stand for the city's pride in its achievements. 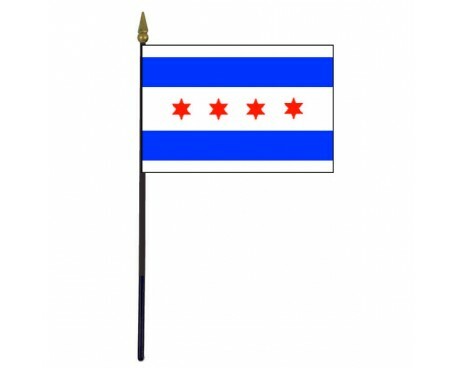 The first Chicago flag was approved in 1917. It bore a strong resemblance to the current flag, but it only included two stars. The third star was added to the flag in 1933, and the fourth star was added to the design in 1939. Several individuals and organizations have proposed a fifth star in the time since the current flag came into use, but none of the proposals have been approved, so it is likely that people will find the current design for the Chicago flag for sale for many years to come.